Following a raised awareness of the ongoing and detrimental effects of plastic pollution in our environment and in a response to the Pope’s encyclical, Laudato Si, on care for our common home, we as a community began looking at ways to reduce our non-recyclable waste. 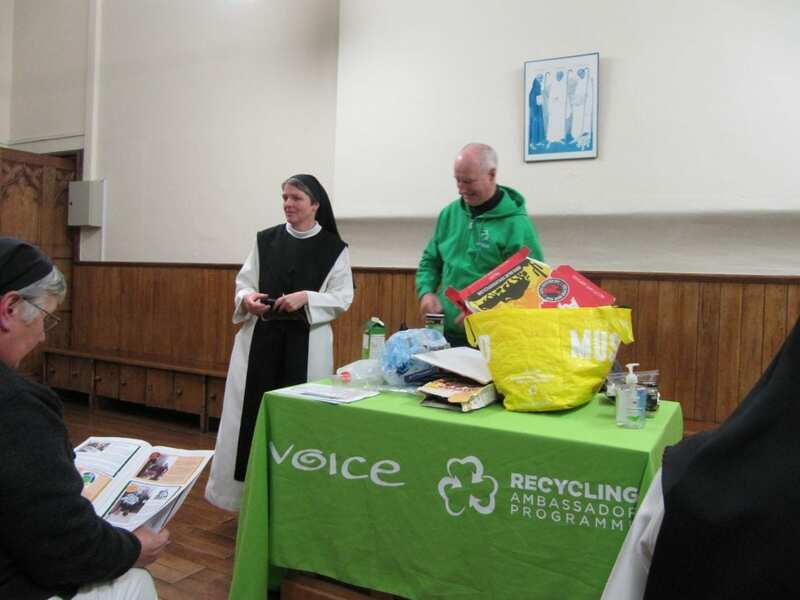 With this in mind and thanks to Karen Nicholson of Ego-congregation Ireland, this month, we arranged a visit from Tony Larkin, recycling ambassador with VOICE Ireland (Voice of Irish Concern for the Environment). Tony ran a very informative and interactive workshop regarding what can and cannot be recycled and placed particular emphasis on the problem of soft plastics, which often end up in our waterways and ultimately in our oceans. We are now rethinking our purchases and looking at ways to reduce our plastic waste. Many thanks to Karen, Tony and also to Tad of VOICE Ireland.